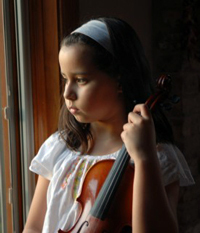 Gallia Kastner, age 10, started private lesson with Betty Haag-Kuhnke at five and a half performing in local events and then traveling with the violin ensemble and as soloist to Colorado, New Mexico and Lincoln Centre in New York as well as performing at WFMT, Channel 11, and WGN Chicago. Currently, she studies with Almita and Roland Vamos at the Music Institute of Chicago and participates in the Junior Academy Orchestra and chamber music coached by Marta Aznavoorian from Lincoln Trio. This year she won 1st place in the Junior I Division at the 2007 Chinese Fine Arts Society and 2007 Sejong Competition. She participates in the swim team and sings in youth choir at St James church.